Taglines: Fight evil... With evil. In 2001 it was announced that Christopher Lambert was offered the role of Kane and was seriously "considering it as it's a very compelling part. Continuity: In the scene where Solomon meet the thieves from the woods again, there is an statue of an angel kneeling with the sword on its left shoulder in the background. The next scene when Solomon is leaning against that statue, the sword is on the right shoulder. If Peter Jackson deemed it a good idea to remake Michael Reeves classic WITCHFINDER GENERAL, the result might look an awful lot like SOLOMON KANE. 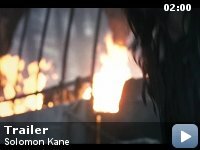 Based on Robert E Howard's 17th Century Puritan pulp fiction character, SOLOMON KANE begins in media res, with Solomon and his ill-fated ship crew coming face-to-face with the grim reaper. This particular reaper, unfortunately, is in the employ of Satan himself and damns Kane's soul for a life of wickedness, greed and throwing knives into peoples faces in a really cool way. A year later Kane, now living in an English monastery, is kicked out when the head monk senses our hero will only bring trouble for the 16th Century peaceniks. On the road Kane hooks up with Pete Postlethwaite and his brood, a family of puritans headed for the coast and a persecutionless life in the New Worlde. Needless to say, the family have 'victims' written all over them in huge, medieval script, and things don't go well. Thematically, the story borrows elements from the Howard story RED SHADOWS, but it's really its own beast. Which is a shame, in a way, because the author knew how to weave a damn good tale and SOLOMON KANE's script is certainly the weakest thing about it. We're never really sure why Kane's soul is damned, or how that's connected with the evil magician who has taken over his father's (Max Von Sydow) castle. 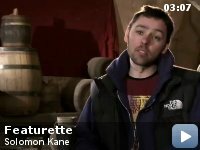 Oh yes, Kane is also a member of the aristocracy, banished from the land by his dad in true Joseph Campbell fashion. Director Michael J Bassett also seems just a little TOO fond of a certain fantasy trilogy. A horseback chase sequence, while exciting, was even more impressive first time around in FELLOWSHIP OF THE RING, while the final assault on Kane's ancestral castle involves a battle in torrential rain, part Helm's Deep, part SEVEN SAMURAI. Most egregious of all is the final showdown between Solomon Kane and, really this is giving nothing away, Old Nick himself. Considering how creative much of the makeup and design work is in the film, and it really is quite striking, it comes as something of a shock to see a certain fire demon turn up for the finale. "You shall not pass!" indeed. And yet....there's so much to like about SOLOMON KANE. As mentioned above, the design work is outstanding. This is a grimy, gritty middle ages that has rarely been seen outside the early work of Terry's Jones and Gilliam. The snowy, grey landscapes of England's West Country (actually Prague, for the most part) are frequently breathtaking. The action scenes are satisfyingly low tech, with seemingly little CGI but plenty of decapitations and arterial sprays. It's a shame they weren't put in the service of a better story, but when the action scenes kick in you're unlikely to be overly concerned. The films biggest asset, however,is its lead actor. It's a little disconcerting watching James Purefoy in this role when you know that he left the production of V FOR VENDETTA having already filmed some scenes as the eponymous character. In some of the many shots where he's silhouetted against the ubiquitous grey and rain-streaked Somerset sky, all flowing cape and stovepipe hat, he's uncannily similar to Alan Moore's anarchist anti-hero. He also shares a similar penchant for dispatching England's enemies with the throw of dagger to the neck. Purefoy plays Kane as if he's in a state of persistent physical agony, which is quite fitting. He's really rather magnificent in the role and brings Hugh Jackman levels of charisma to the part. No small feat considering Kane is the sort of chap who makes Matthew Hopkins look like a member of the ACLU. 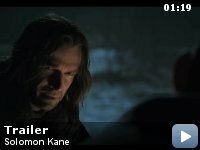 Purefoy's Solomon Kane may also be the first swashbuckling, sword wielding hero with a British West Country accent since Nigel Terry's King Arthur in Excalibur. Purefoy is the main reason that, at the end of the film, with the suggestion of more adventures to come, you hope SOLOMON KANE will do decent enough box office to warrant a franchise. This first outing is far from perfect, but there's considerable potential and the distinct promise of better to come.